The Container Registries page lets administrators record and manage information about public and private Docker container registries, including the registry location and access credentials. These registries can then be used to create containers directly from the Skytap web interface. By default, Skytap includes the Public Docker Hub registry, which can be used to download and install common Docker images, such as web servers and databases. The administrator can add other registries, including private registries. You can have a maximum of 500 registries for your account. For more information about Docker registries, see Docker Registry. The Docker Hub registry is available at index.docker.io. 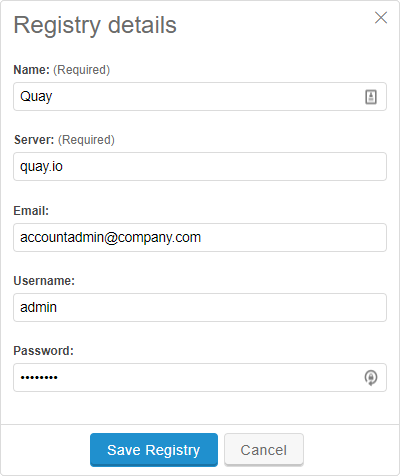 Click Admin > Container Registries. The Container Registries page displays. Click (Add Registry). The Registry Details dialog displays. Name – Type the name for the registry that displays in Skytap. A registry name is limited to 100 characters. Server – Type the URL for registry server. Email – Type the email address for the user who has access to the registry. Username – Type the name for the user who has access to the registry. Password – Type the password for the user who has access to the registry. In addition to the Public Docker Hub and other hosted container registries, you can create your own registry server on a local computer. To create a private registry server on premises, follow the instructions for Deploying a registry server. Follow the steps above (Adding a registry) to add the private registry server to the container host. (Enabled) – Users can add containers from this registry. (Disabled) – This registry isn’t available. Click (Edit container registry). The Registry Details dialog displays. Name – Type the name for the registry. Server – Type the URL for registry. Click (Save Registry) to commit the changes to this registry.